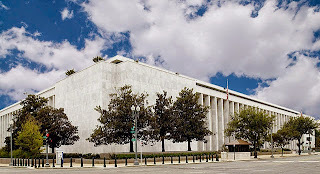 In February of this year (2015) our close friends from California invited my husband and me to join them in Washington, D.C. for Spring Break (April 6-11.) Seeing our friends, the cherry blossoms, and several Washington museums were great draws. 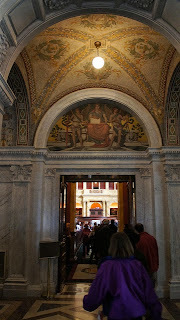 But as a family researcher, I was tantalized by the prospect of visiting the Library of Congress for the first time. As it happened, there was a book I needed that was at the Library of Congress. During my research on the Hanneman family line (see my post of April 4, 2015), I found that the National Genealogical Society’s (NGS) Annual Conference in 1997 had been held in Pennsylvania. Image from page 4 of "National Genealogical Society quarterly"
A google search led me to worldcat.org which showed that the Library of Congress has a copy of this conference syllabus. Having attended NGS conferences in the past two years, I know how much information can be found in the syllabus. NGS always includes several workshops devoted to the city/state that is hosting the conference. I might find some real gems about Pennsylvania. So now I had a research need. I have been accessing the Library of Congress Digital Collections section of the catalog at home to find wonderful photos for my blog. But I have never been actually in this historic building. Now was my chance. Since this was mostly a trip to see friends and go sightseeing, I didn’t really have time to prepare to do research. Usually I carefully study the museum/library/society that I will be visiting. This time I just checked the hours of operation and had the one resource that I wanted to request. This lack of planning almost proved to be my undoing and led to a few unwelcome surprises. 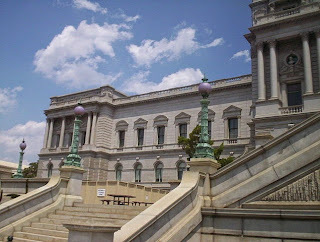 We arrived at the main (Jefferson) building of the Library of Congress in the early afternoon. First we took a tour of the building, and this was when we had our first surprise. The guide told us we could look down at the Library of Congress Main Reading Room from the balcony but that only researchers could actually enter the room. In addition, the guide continued, a researcher could only access the room if he/she had a reader’s card. After the tour, I went to the information desk to ask where I could get a reader’s card. to the Reader Registration Station to apply for a Reader Identification Card. 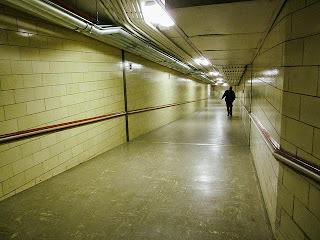 In order to get to the Madison Building, we were sent to the tunnel that joins the two buildings. The walk took about 10 minutes. Once you get to the Station, the process of getting the card takes about 20-30 minutes, depending on the number of patrons waiting. With our newly minted cards in hand, we trudged back through the tunnel. I was so excited to actually be on my way to the Reading Room at last. The last stop before the Reading Room is the Researcher’s Entrance where you sign in. When you step through the door, you are actually in the anteroom that now serves as the Local History andGenealogy Room which adjoins the Main Reading Room. 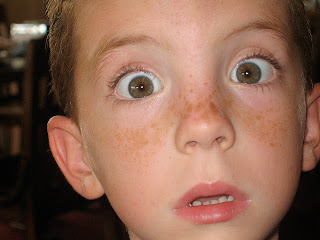 I was fortunate to find a reference librarian able to assist me in looking up the resource I needed. He introduced me to the Automated Call Slip on the Library of Congress' Online Catalog. You can fill out your own Call Slip on your laptop or by using the computers in the Computer Catalog Center, across from the Reader’s Entrance. You request the material online. The Library of Congress receives the request online. 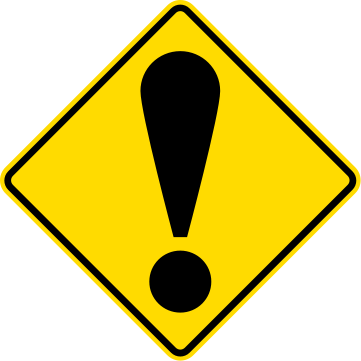 You are notified online when the material is ready to be picked up. This is where the third surprise happened. I decided to ask someone at the information/materials pick-up desk in the Main Reading Room what average turn-around time is. The answer was from several hours to a full day!! Get your Reader’s Card early. Request your material on the Library of Congress’ Online Catalog using the Automated Call Slip (you must have a Reader’s Card first) early; if possible, the day before you want to pick up the material. The last day of our trip, I was able to pick up my requested material: The National Genealogical Society 1997 Conference in the States Program Syllabus, “Pennsylvania Cradle of a Nation.” I had completed the process. 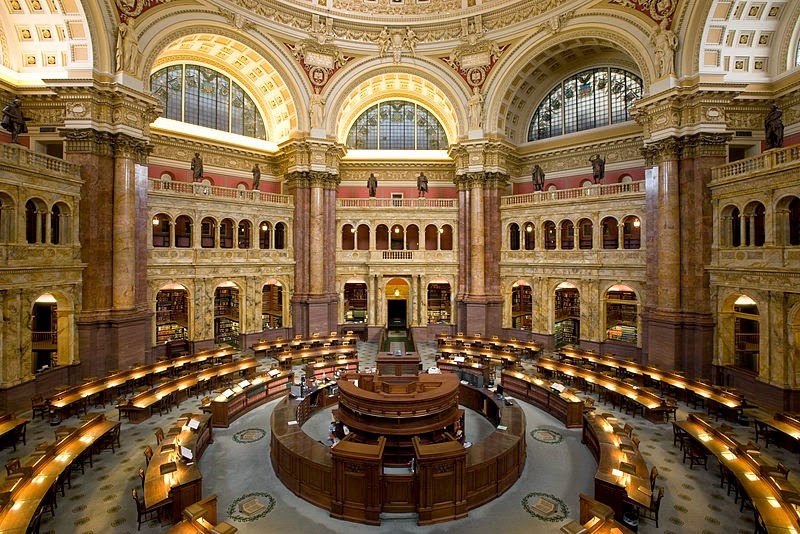 For more information on the Library of Congress' research treasures, view a video at familysearch.org. Labels: genealogy tools, Library of Congress, NGS, Washington D.C.